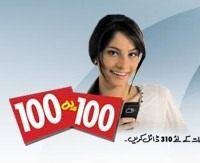 Zong has announced this mega treat for its customers, named 100 pay 100. Now Zong customers can get 100 percent of free balance on every 100 plus recharge. For instance, if you recharge Rs. 100, your new account balance will become Rs. 200 (before tax deductions). With the 100 pai 100 offer Zong customers will be able to receive a 100% free balance on every load of a 100+. The balance will have an expiration date of three days i.e. the free balance can be used within three days. Extra incentive: customers that load a balance of more than a Rs1000 will receive a cash bonus of a Rs 100 which may be used for other services besides phone calls. This bonus is on top of the 1000 balance that the customer will receive. The bonus money will automatically added into your account once there is a new recharge – you don’t need to subscribe for anything. The bonus that will be added for a recharge of 150 is a 100, bonus is added with multiples of a 100 i.e. if you load a balance of 200 you will receive 200 extra balance. For every multiple of 100 the customer will receive a balance of a 100 and an extra cash balance of 100 for reaching a 1000. Hence a recharge of a 1500 will receive 1500 extra balance and additional 100 cash. 20% of the balance can be used to make offnet calls while 80% can be used to make onnet calls. if i load 100 rupee then there will be 82 or 80 balance then can i avail offer or not? msg myn 100 py 100 ka balance bataaya jaa rahaa hy jub K miltay 100 mint hyn.plz balance k bajaaye 100 free mint bataaye jaayn. behar haal ZONG kaabal e taareef hay. jb bhee koee sahoolat deta hy sub sy behtar deta hy. With Zong it’s as simple as 1 + 1, Rs. 100 means Rs. 200 ! yes, double your balance on every recharge, Zong now brings a ground breaking offer which doubles your balance on every recharge ! How do I subscribe to this promo? There is no need for subscribing; the bonus will automatically be updated ounce there is a new recharge. If I load a balance of 150, how much bonus will I receive? How will I be charged if I am already on a package like 12 Aanay? Can I use the extra recharge for sms or other Vas related services? No, the extra balance can only be utilized on calls. Can I use the extra balance to make offnet calls? Yes, 20% of the balance can be used to make offnet calls while 80% can be used to make onnet calls. What benefit will I receive if I recharge a balance of Rs 1500? They are talking about Balance in Rs. not minutes. So they are not talking about Rupee value, its Minute value. I ca’nt like this offer zong 100 pay 100.you can expend expited date atleast 30,days. I like this pakcgae but time duration is 3 days very low …. hahaha, zong ne kya mazak keya hai, free balance nahi hai free mints de rahe hain..
i have just confirmed, that its balance, but this balance is in the shape of free minutes, i.e. you can use this balance to make calls only,still some thing good, i mean loading 100Rs card will double your talktime, what else we need. btw did any see the ad for this offer? it was disgusting really :S after making such an awesome ad of “muji babu ban gaya” this one was below retarded . the free BALANCE given will only be utilized for calls, so actually its free MINUTES!! Right? offer is good but zong should extend validity minimum 15 days.please tell me how can I check my free minutes , short code is required. my balance is not double.I got only fifty minutes for three days vality which is not sufficienct. Can some one tell how to check remaining minutes? Admin? Salam bhai yah recharge say pehlay much dial karna parhta hay? its a bogus scheme by zone. i just loaded rs 100 and made few calls. then checked my balance was being deducted. i checked my ecare portal and NO FREE AIRTIME was mentioned. Then talked to customer care they said blah blah and then they said matter taken up etc. i dont understand y waste millions on ads abt free offers that are not actually there. ! btw still after emaily CS i dont have free airtime. got free mins after complaining! 100 pay 100 kaha ??? they are giving 50 on net minutes and 13 off net minutes to be used within 3 days. i think they should not use 100 pay 100 as it is misleading, it is better to say that they are offering free minutes. Itne offers dene ki bajae, Tamam Networks sirif ye Mehrbani kar den ke Consumers se GST apne end per le len. 3> can’t use the balance to activate any package for sms, free mins, internet etc. in otherword this balance offer is just _______. zong is the best…..agar kisi ko b zong ka number chaiy tu plz contact me 03147988036…. Yesterday I recharged 100 and not a single free minute (ON NET / OFF NET) was given, I guess this offer has ended without notifying anyone !! !